Is Your Building Ready for Impact of Remote Working? Building owners can respond by taking a look at parking areas, floorplans, and tenant mix. You may have noticed less traffic in your office spaces on Friday afternoons, and it’s not because your tenants are starting their weekends early. Remote working is a rising trend that occurred in 85 percent of American companies in 2018. In fact, 52 percent of employees worldwide work remotely at least once a week (not to mention the 16 percent that work remotely about once a month). This trend should come as no surprise, as Millennials — the generation known for craving independence and flexibility — now make up more than a third of the U.S. workforce, the most of any generation. The rise in connectivity has given more employees in a wider range of industries the option of working remotely. Constant communication is a concept we are all familiar with, and it’s achievable in the workplace through tools like Slack, Skype, and Google docs. Companies are even beginning to offer remote working and other benefits in the place of salary raises, and employees are happily accepting these incentives. With the growing number of employees working remotely, workspaces are being altered to fit the rising trend. Businesses are downsizing, opening their floor plans and even changing their parking models to catch up to the modern office style, and building owners and property managers should be aware of the trends. 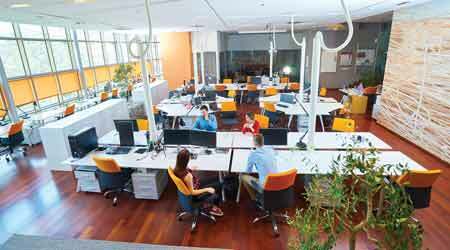 The most notable trend in office spaces is the significant decrease in square footage per person. In 2010, workers were given an average of 225 square feet of personal space, which is the typical size of a large office. In 2017, a person’s average work space decreased to just 151 square feet, nearly a third smaller. The fact is, as remote working becomes more common, companies simply aren’t paying for spaces that won’t be used. 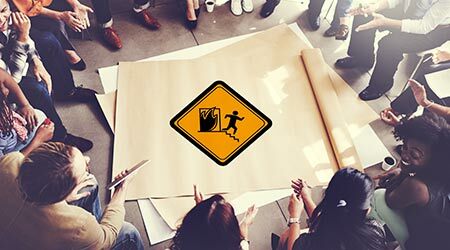 With fewer bodies in the office on a daily basis, businesses are choosing to forego the concept of one office per employee. Instead, they are looking for buildings with open floor plans and communal spaces. The open spaces encourage collaboration among those who choose to work from the office, but companies still want a few private spaces for employees when they have meetings or just need some silence. In this model, each employee has his own desk, but the company doesn’t waste space on large offices for every worker when many may not step into the office more than once a week. You don’t have to be a genius to know that fewer workers in the office means fewer cars in the parking lot. Not to mention, public transportation and the rise of ridesharing services have hugely decreased the number of cars on the road, especially in top-tier cities. Interestingly, though, businesses in second- and third-tier markets, like Nashville, are even resorting to providing little to no parking for employees. Since the 1950s, cities have implemented zoning codes to keep up with the demand for parking spaces, but the trend is changing. In fact, Buffalo, N.Y., was the first city to completely abolish city-wide minimum parking requirements for commercial and residential projects early in 2017. Several cities have either reduced or removed parking limits in certain areas. This modification will continue in various U.S. cities, and it favors developers, building owners, and property managers. If you’re looking to expand your building, think about taking space from your parking lot. Or consider sharing your lot with other businesses to save on unnecessary expenses. People enjoy the comfort and independence of working remotely, but that doesn’t necessarily mean they’re working from home. Often, remote employees desire a space where they can have their freedom but still be surrounded by hard-working individuals and not be tempted by the laundry-list of chores at home. Enter the coworking space phenomenon. Coworking spaces offer rentable areas for workers trying to escape the isolation of their homes. Spaces can be rented on a monthly, daily, and even hourly basis and can be used to host meetings or simply for individual work. The spaces are typically an open floor plan with some private meeting spaces, a good WiFi connection, and plenty of coffee. Remote workers, freelancers, entrepreneurs, and small teams thrive here. Americans are taking advantage of the benefits of coworking spaces. In 11 years, the number of spaces provided has grown more than 300 times, from only 14 locations nationwide in 2007 to more than 4,500 in 2018. So, if your building has availability (especially if the space is not adequate for medium to large companies), consider taking advantage of this trend. By offering flexible working spaces, you are opening yourself up to a whole new market of workers and businesses seeking shorter leases. There is even more demand for rentable office space closer to residential areas, so this idea can be especially beneficial if your building is located on the perimeter of a city. The rise in remote working doesn’t have to be daunting for building owners. In reality, trends in work spaces are always changing—big individual offices were common in the 1950s, cubicles took the reigns as the standard in the 1980s, and now we’re entering a time where smaller spaces and open floor plans are key. What’s important is staying on top of these trends and offering your tenants the next big idea before they realize they want it. Wood Caldwell is a principal at Nashville commercial real estate firm Southeast Venture and has more than 30 years of experience in commercial real estate development and sales.